PERFORM 3D is a highly focused nonlinear software tool for earthquake resistant design. Complex structures, including those with intricate shear wall layouts, can be analyzed nonlinearly using a wide variety of deformation-based and strength-based limit states. Model data can be imported directly from ETABS and SAP2000. A wide variety of element types are supported, including beams (with panel zones), columns, braces, shear walls (with openings), floor slabs, dampers, and isolators. Nonlinear analyses can be static and/or dynamic, and can be run on the same model. Loads can be applied in any sequence, such as a dynamic earthquake load followed by a static pushover. PERFORM 3D provides powerful performance based design capabilities, and can calculate demand/capacity (usage) ratios for all components and all limit states. Performance assessment based on ATC-40, FEMA-356 or ATC-440 is fully automated. I received this patch in my PM from Metto. Using the License Generator your license will be for 365 days. This patch extends the license to 65535 days. - This is a complete, self-contained package using the Full Installation CD and the 'CSI License Generator 11' already featured in this thread. - Made portable with Spoon Studio. 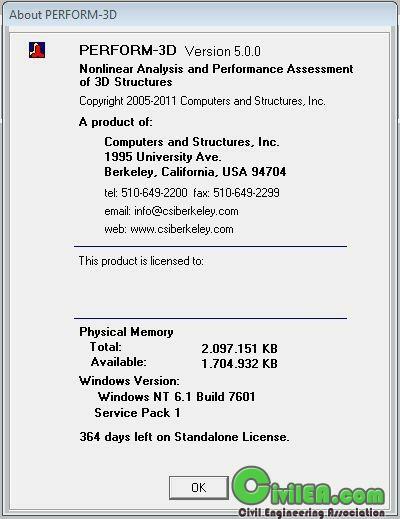 - Tested on Win7 and WinXP with .NET Framework 3.5 SP1 previously installed. - Un-zip on PC and run from there, not from memory stick, for best performance. NOTE: on PCs running McAfee virus protection, a warning of a “Generic Trojan” may occur for the downloaded file. This is a confirmed false positive. Simply add the portable program to the trusted applications. Please check one by one, some link stil OK.